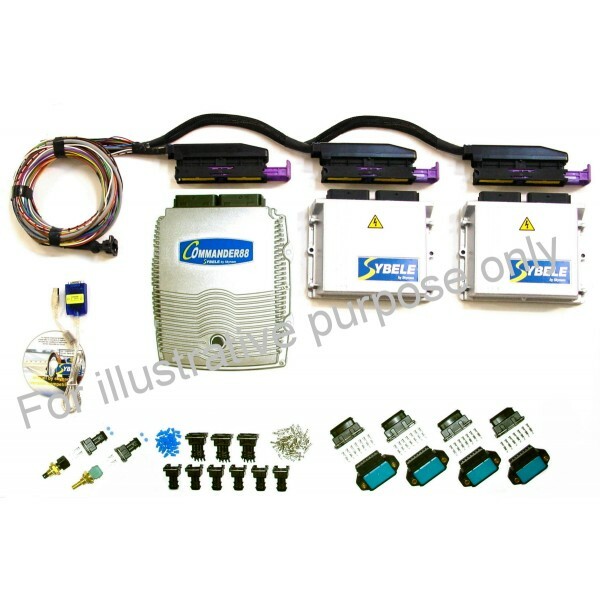 The Commander88 direct injection inductive double driver kit is based on the Commander88 ECU to which are added two DMg06 inductive drivers for driving the inductive injectors which need a high tension and current command. • It allows managing 1 to 8-cylinder engines in direct injection and static ignition (managing 8 cylinders means 8 injection commands, and as the inductive driver DMg06 owns only 6 channels, two drivers are needed, each controlling 4 injectors). • For 1 to 6-cylinder engines, you can then use Commander88 direct injection single driver kit. • It can manage straight engines and 'V' engines as well, with a separated management for each bank of cylinders (intake, Lambda, turbos, fly by wire and camshafts for each bank). The kit being based on the Commander88 ECU, the overall functionality is the same (see standard kit description). When Commander66 is used in direct injection, injection is sequential, phased on the start of injection. The phase of the injections is controlled by 1/10 degree. 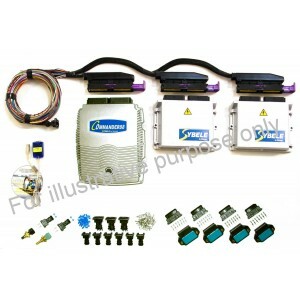 The injectors command is configurable to adapt to the needs of the injectors to drive. • The withstand for which a switching of the high voltage is made to keep on the current level (adjustable length and switching). The Hold, during which the voltage is supplied by the engine 12 volts battery supply with current control by switching the battery power to maintain the opening of the injector without damaging it by an excessive rise of its coil temperature (level of hold current adjustable from 1 to 16A). In PWM by the fuel flow supplying the pump, the frequency and direction control are adjustable. This is the type of control needed for most of engines. In engine synchrone command with tuning of the number of came push per engine cycle and push phases (to follow the camshaft drift). This is the type of control needed for VW FSI engines. Whatever the type of command used, the RCO of the command is managed by a PID to follow the pressure target. The fuel pressure is given by the balance achieved between the filling of the ramp by the pump and its emptying by the flow of the injectors. At the cutoff during deceleration, the injectors being stopped, it is not possible to reduce the fuel pressure (if needed) by the normal operation, and the resumption of injection (including idling) can be at a pressure much higher than desired. A programmable function of ramps injectors emptying during deceleration cutoff has been included in the management of fuel pressure. • The Commander88 ECU is provided with accessories to install it on the direct injection engine. This loom is pre-wired on the ECU and driver side connectors, with sensors and actuators connectors not installed. You can download the installation CDROM parts from Skynam website.